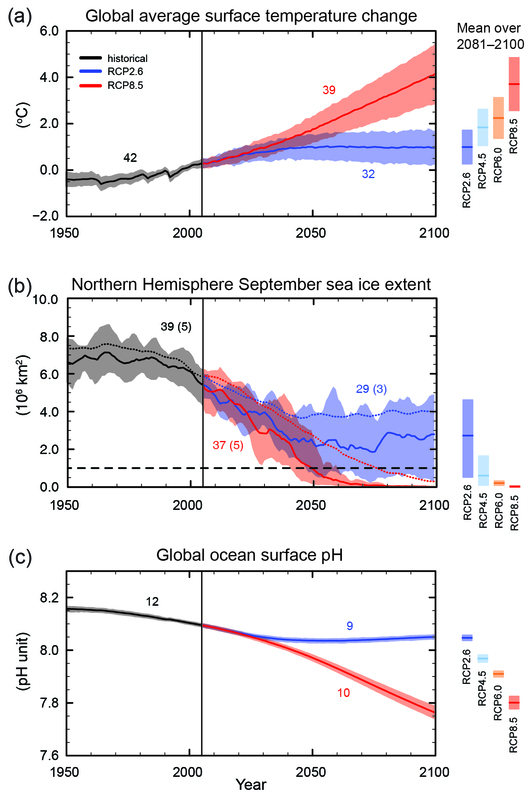 The current IPCC’s Fifth Assessment Report was written by three working groups. Working Group 1 reviewed the latest in climate science and models to what extent humans are responsible. Working Group 2 analyzed the impacts of climate change on ecosystems and society. And Working Group 3 explored solutions to mitigating climate change. The working group reports have had staggered releases: WG1 in September 2013, WG2 in March 2014, and WG3 in April 2014. Together, they will be finalized as the Fifth Assessment Report next fall. 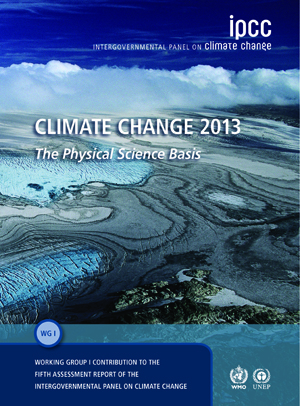 In 2007, the IPCC was co-awarded the Nobel Peace Prize for their Fourth Assessment Report. In a series of three blog posts, we will summarize each of the three working group reports, highlighting the most important information. – The Earth’s climate has warmed, without a doubt. Since the 1950s, many of the observed changes are unprecedented even over decades to millennia. The atmosphere and ocean have warmed, the amounts of snow and ice have diminished, sea level has risen, and the concentrations of greenhouse gases have increased. – Each of the last three decades has been successively warmer at the Earth’s surface than any preceding decade since 1850. 1983-2012 was likely the warmest 30-year period of the last 1400 years. – The atmospheric concentrations of carbon dioxide, methane, and nitrous oxide have increased to levels unprecedented in at least the last 800,000 years. – The largest contributor to climate change is carbon dioxide in our atmosphere. Since 1750, the CO2 concentration is 40% higher. – It is extremely likely that more than half of the increase in global average surface temperature from 1951 to 2010 was a result of a human-caused increase in greenhouse gas concentrations. – Continued emissions of greenhouse gases will cause further warming and changes in all components of the climate system. How we might adapt to these changes will be the subject of the next post in this series, on impacts, adaptation, and vulnerabilities. – Between 1971 and 2010, the oceans absorbed over 90% of all warming due to climate change. This has made our oceans more acidic, has caused seas to rise, and has allowed climate deniers to claim global warming stopped with a plateau in air/surface temperatures. – Over the period of 1901 to 2010, global mean sea level rose 0.19m, and the average rate of sea level rise has accelerated, doubling in the last century. – The effects of climate change work in a positive feedback loop, meaning further warming will accelerate any changes. The science of climate change can be difficult to understand, even for us environmental advocates. But there is no denying climate change is happening and it’s happening now. Update: Read our summaries of WG2’s “Impacts, Adaptations, & Vulnerabilities” here and of WG3’s “Mitigation of Climate Change” here.